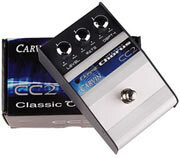 Achieve a vintage rotary speaker effect with Carvin's CC2 Classic Chorus pedal. Add shimmer to your clean rythms or thick organ-like swells to overdriven leads. Other chorus pedals can dampen your guitar's tone and volume. The CC2 features a level control to boost the chorus volume as well as a rate and depth control. This stereo chorus also has stereo right and left output jacks for connecting two amps. Rugged steel construction with brass chromed knobs (no fragile plastic to worry about!) . 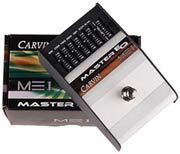 Carvin's ME1 Master EQ pedal will give you the control you need to customize your tone. Boost or cut your lows, mids or highs by 15dB for a custom tone. Center frequencies: 100, 200, 400, 800, 1.5k, 3.2k, 6.4kHz. Carvin's "Ground Effects" are premium quality guitar pedals. Rugged steel construction with brass chromed knobs (no fragile plastic to worry about!) The AC power jack and input output jacks are located at the top of the pedal for close side by side arrangement on a pedal board. 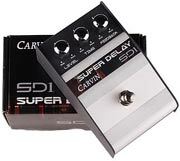 Fill up the stage with Carvin's SD1 Super Delay pedal. Choose from long or short delay times while adding a custom amount of feedback to customize the delay. Add a little delay to fill up your rhythm or go wild with multiple echoes. Carvin's "Ground Effects" are premium quality guitar pedals. Rugged steel construction with brass chromed knobs (no fragile plastic to worry about!) The AC power jack and input output jacks are located at the top of the pedal for close side by side arrangement on a pedal board. 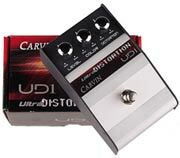 The UD1 Ultra Distortion pedal is a thick distortion that has a lower end "metal crunch" capability. Level, color (tone) and distortion controls can be set to deliver moderate to thick distortion. Want the look of a chrome 60's vintage wah pedal without the high price? Carvin's VW1 Vintage Wah pedal has the classic chrome wah look and popular wah wah sound perfect for funk, rock, etc.